Baia do Sancho Beach, Fernando de Noronha, Brazil. 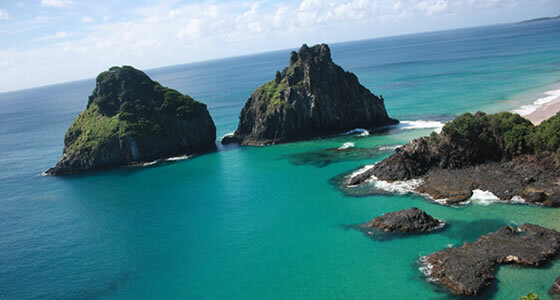 Baia do Sancho is an expansive sand beach and tops the list of being one of the most beautiful beaches of Brazil. The locals call Baia do Sancho both a beach and bay. You can reach the bay either by trekking down a short trail or by sea. The beach is protected and surrounded by native vegetation and high rising cliffs, which makes the perfect nesting ground for birds. The sand on Baia do Sancho is white and the water is emerald green. If you happen to take the boat, you just need to stop for a quick swim. The clear crystal water is ideal for diving as well. The cliffs surrounding this beach make a perfect spot to view dolphins spinning and diving into the water. If you happen to be on the island during the rainy season between the months of February and June, you’ll be in for a pleasant surprise, because the Baia do Sancho comes alive with two most beautiful waterfalls cascading down from the cliffs into the sea. This phenomenon is caused by rainwater and is a real treat for the eyes. But these months are the best time for the egg-laying turtles; hence the beach is closed from late noon to the next morning, so make sure to be on the beach early during the rainy season.